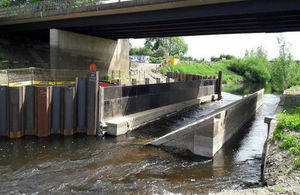 Construction of a channel that will improve the Environment Agency's ability to predict flooding in York is being carried out in the River Nidd. The channel is being built in the river where it passes under the A59 at Skipbridge, Green Hammerton, between York and Harrogate. Once the channel has been built an ultrasonic sensor will be attached under the bridge so accurate flow readings can be achieved. This is important for predicting floods in York because the River Nidd is the last major watercourse flowing into the Ouse. This is one of the Environment Agency’s critical assets for our flood warning service and for managing water resource available for abstraction. Having an early warning that the Ouse could overtop in York means we can act early to prevent flooding by closing flood gates in the city. So that the concrete lined channel can be built a cofferdam has been put in place. One half of the river is dammed off to create a dry working area to enable construction on that side, before the other side is dammed and the new channel structure can be completed. There was an existing concrete channel built a number of years ago but due to the design and flow dynamics it created in the river the bed got silted up, causing incorrect flow readings and it not working as an effective gauge station. The new channel is designed to make sure sediment passes through it and flow readings are accurate. Lower river levels have enabled us to make really good progress and we expect the gauge station to be fully functioning this winter. North Yorkshire County Council’s Highways Department has carried out work on the bridge and road earlier this year and Northern Powergrid also recently installed an electricity line across the bridge.